Drinking coffee while at the same time smoking cannabis is a common ritual for many connoisseurs. Is the perfect symbiosis we think it is? Let's find out. Using several drugs in combination is a phenomenon among users of legal, decriminalized, and illegal drugs. It usually aims at blending effects from two or more substances together to create a new and slightly different effect, to the one that these substances are capable of causing when taken without interference. Creating a new effect is likely to work in some cases, considering the great variety of psychotropic plants and organisms that exist on planet earth, but mixing drugs is also associated with a certain risk of not knowing how different compounds interact. Ongoing progress in the US edible industry led to the development of cannabis-infused beverages that contain two popular substances: THC and caffeine. Sounds amazing from a convenience point of view, but what happens in our brains when we mix cannabis and coffee? Researchers looked into that question and gathered data from what we call the “stoned monkey study”. DO CAFFEINE AND THC FORM A NEURO-CHEMICAL MIX? First of all, it’s interesting to know if THC and caffeine mix on a neurochemical level, meaning the creation of a new effect that both of these substances aren’t capable of causing on their own. Dr. Scott Krawover, unit chief of psychiatry at Zucker Hillside Hospital in New York, thinks this is clearly the case. He has reason to believe that the combination of caffeine and THC may worsen a person’s working memory and consequently work against the user. Caffeine can be seen as a stimulant that encourages neuronal activity by blocking receptors from receiving adenosine, a compound that causes relaxation and promotes sleepiness. When we drink coffee we allow our neurons to transmit impulses at a faster pace, resulting in a feeling of being alert. THC is a depressant in medicinal terms, doing kind of the opposite what caffeine does, namely promoting a feeling of calmness by lowering the rate of neurotransmission at certain receptors in our brain, instead of raising it. The type of high is indeed a little different when caffeine and cannabis are enjoyed in combination. Animal trials, in general, are not something mankind can particularly be proud of, especially when they’re not in a direct medicinal context to develop medicine for people suffering from serious diseases. However, researchers did something comparatively harmless and exposed squirrel monkeys to THC and MSX-3, a soluble form of caffeine. These animals could pull a spring to receive a dosage of THC, and a group of them were also given MSX-3. As the dosages of MSX-3 were increased, they pulled the string to receive THC fewer times than normal. The monkeys seemingly needed less THC to reach the desired effect. After a long period of abstinence, they were reintroduced to either pure THC or a mix of THC and MSX-3. The monkeys who received the mix pulled the string more often, leading us to the assumption that a mix of caffeine and THC promotes more craving, making it harder to quit. These monkeys did experience some kind of high improvement, prolonging the effects of cannabis, but they also liked the “coffee-high” a little bit too much, going bananas about it. 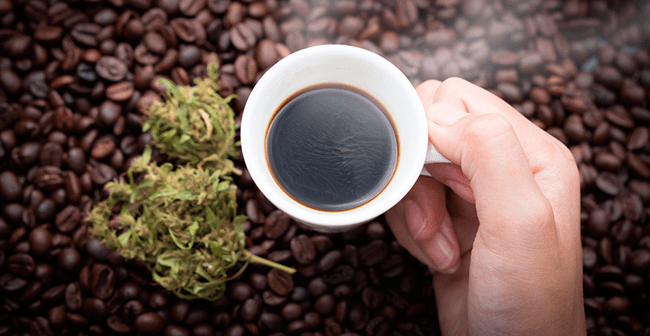 DO CANNABIS AND COFFEE FORM A PERFECT SYMBIOSIS? Weed and coffee form a delicious symbiosis that’s for sure. A perfect symbiosis looks different we sadly have to admit. Coffee lets our neurotransmitters fire more rapidly and then THC tries to lower our neuronal activity again. This seems counterproductive. Maybe we need to decide which way we want to go regarding our neurotransmitters – rapid fire or half throttle? Both of these options can potentially come with advantages depending on the individual brain chemistry and situation. The stoned monkey study showed that we might find it harder to quit when we mix, but also that the amount of THC can potentially be reduced to reach a satisfying effect. Cannabis And Astrology: Which Strains Do The Stars Say You Should Smoke?